Here we go, boys. The must win game. It's only week 3, but we have to have this one. If the Seahawks don't stack the box against the Cowboys, I would be very surprised. I think the Seahawks defense lines up very well vs the Cowboys as long as they are able to keep Zeke in check, which is going to be really difficult. Offensively, Russell Wilson needs to play much better. We need to see the Seahawks call some quick passes and Wilson needs to stop holding on to the ball for so long. The Cowboys defense has looked impressive the first two weeks of the season, so the offense needs to really step it up. Would also like to see more carries from the backs in the running game. Earl Thomas with his 27th career interception. Bobby Wagner making his presence felt vs the Cowboys run game. Brandon Marshall drops a clean pass by Wilson 15 yards down the field that would have kept the drive going. So far the story of this game is the Seahawks defense has been great and the offense cannot do anything. Very bad offense from both teams so far. The Seahawks just picked up a first down, so things are looking up haha. 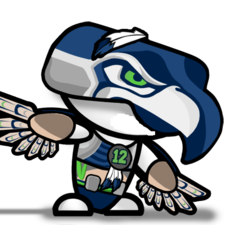 Touchdown Seahawks! Really good play by Wilson that drive. Got the ball out quickly, but the Cowboys seemed to have some confusion because guys were more open than they should have been. Haha Earl Thomas with 2 interceptions vs the Cowboys. Poetic Justice. I still want to blow it up. A good home game against Prescott doesnt make me feel any different. Im glad Earl is having a good year so far. Up that trade value before the deadline. Good to see us win but yeah i am not really convinced we are a good team we just ran into a team that offense plays as poorly as ours.